A chemical compound composed of magnesium, sulfur and oxygen, magnesium sulfate, or Epsom salt, takes its name from the town of Epsom, England, where it was discovered in well water early in the 17th century. Epsom salt, which long was used to treat common ailments such as sore muscles or insect bites, was gradually replaced by other products during the post-World War II chemical industry boom. But Epsom salt still is used by vegetable gardeners to control pests. Magnesium content in Epsom salt acts as a fertilizer that helps seeds germinate. However, many gardeners also say Epsom salt is an effective repellent for a variety of pests. In 1937, the academic journal Science reported that a mixture of Epsom salt, bran and molasses was an effective treatment against grasshoppers and other crawling insects. Because of the salt's unpleasant flavor, some gardeners believe that sprinkling Epsom salt on the leaves of a vegetable plant will prevent chewing pests such as deer, rabbits and groundhogs from raiding a garden.Those who favor this type of treatment say Epsom salt will not damage the plant, but it will wash off in the rain or wear off with time. Gardeners who recommend using Epsom salt directly on plants also advise reapplying it every week. Other gardeners who use Epsom salt to control garden pests recommend mixing two tbsps. with a gallon of water and spraying vegetable plants. Epsom salt has been effective against the Colorado potato beetle which often damages tomatoes and eggplant. Epsom salt is also said to be useful in preventing slugs and snails from damaging vegetable plants. Some gardeners suggest sprinkling a circle of Epsom salt around the base of each plant. Although many gardeners swear by Epsom salt, there seems to be no scientific proof that it is an effective repellent of garden pests. Dr. Linda Chalker-Scott, an associate professor at Washington State University's Puyallup Research and Extension Center, has reviewed the scientific literature on Epsom salt and concluded there is nothing to suggest that it works either as a pesticide or a repellent for larger animals. She also warns that when Epsom salt is applied as a spray, it can damage or scorch the leaves of a plant. Excessive use of an Epsom salt spray can also cause root damage. 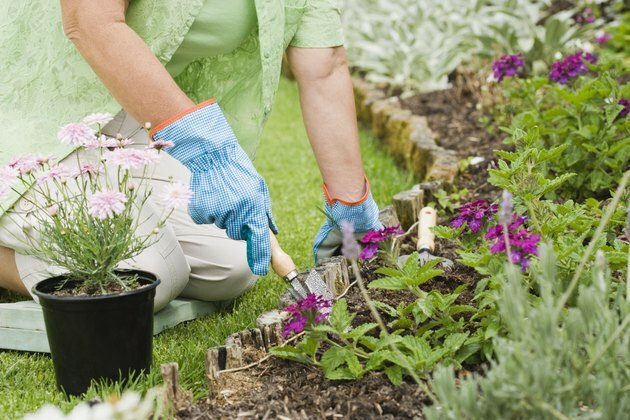 Many people would prefer to use a natural, household product to treat a backyard garden for pests because it is easy, affordable and viewed as a safe alternative to commercial chemical pesticides. However, Chalker-Scott urges gardeners to ask two questions before introducing any chemical into the environment: Is it needed, and will it cause any damage? And even in the case of a product as familiar and trusted as Epsom salt, one should research any claims to see if its use is justified. What Is the Solution for Epson Salt to Kill Weeds? Who Invented the Apple Peeler?